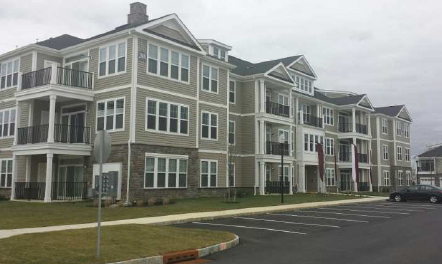 Glassboro Borough, Gloucester County, New Jersey – Construction was recently completed and a grand opening held for Essex Chase Apartments. This 252 unit apartment rental community on 33 acres was constructed and is owned by Fieldstone Associates. Started more than 10 years ago and moving toward a new South Jersey community stretching over portions of Glassboro Borough and Elk Township, Camelot/AURA is becoming a strong community of residential and commercial opportunities. Community partners include Beazer Homes, D.R. Horton, Ryan Homes, Chiusano Homes, and Canuso Homes. Engineering and approvals included County Road widening and entrance approvals, and special attention to stormwater requirements.